The Sea Raider Special was a 12 cylinder, V type, and the original engine used in 104 Ft. boats, later replaced with Hall-Scott Defender engines and even later with Packard 4M-2500 engines. At 1414 CID, and 450 to 550hp. the Sea Raider Special was smaller than either of the other two. The Sea Raider engine was dry sump, with four overhead valves per cylinder and overhead cams. Each cylinder was ignited by twin spark plugs.For those seeking more detail, the engine manual is posted in the Manuals & Publications section of the website. The Sea Raider Six was used in 42 ft. boats, along with Hall Scott Invader engine. Displacement of the Sea Raider Six was 800 to 1000 CID, depending on the source. It shared many of the features of the 12 cylinder engine, although it was not essentially a 12 cylinder block cut in half. It was designed as a marine engine and was not a conversion of an automotive engine. The Sea Raider Six engine was a straight six and like the 12 cylinder, dry sump with a 24 qt. capacity, with four overhead valves per cylinder and an overhead cam. Each cylinder was fired by two spark plugs. One internet source gives the following specs: 5.75” X 6.00 Stroke, 840 CID (the math is a little off), 200hp at 1800RPM, 260hp at 2400RPM. Most sources list it as a 250hp engine. In the 42’ operator’s manual the engine is shown with twin carburetors. The Sea Raider Six has a 4.9 to 1 compression ratio and burned 72 octane gasoline. With its heat exchanger and reverse gear, she weighed in at 2,500 lbs. with fluids. This engine is not the Sea Wolf engine which was 678 CID and 225hp. although it had many of the same features. Chris-Craft had a history of using Kermath engines before the war and built a number of the 42 ft. rescue boats. It is likely that Kermath Sea Raider Six engines were used in most, if not all, of their rescue boats. James Kermath was the founder of the company and immigrated from Canada to Detroit in 1899. He was part owner of Eclipse Manufacturing Company, a machine shop which built small engines on contract until 1907. Kermath built a few automobiles in 1907 and 1908. Kermath changed employers in 1907 but in1910 he formed the Kermath Manufacturing Company, of which he was part owner. 1911 was the year that 'The Kermath' marine engine was introduced. It was four-cycle, four-cylinder and rated at 12 HP. It was the first engine to carry the Kermath name. In 1915 the 20 hp. model 20 was introduced while they continued to manufacture the model 12. They planned to build 200 of the new model 20's in 1915. Kermath Manufacturing Co. appears to have incorporated in 1916 or 1917. It seems likely that investors bought into Kermath Manufacturing about 1916 and James Kermath was either forced out of his company or sold his interest. A 1924-25 business directory shows the company as manufacturers of tractor and marine engines and John B. Farr as president. Kermath Marine Engines produced engines from sometime in 1910 until sometime in the 1950s in models from single cylinders to V-12's. The Kermath slogan was "A Kermath Always Runs". 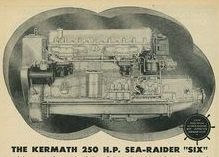 Kermath Marine engines were commonly used by Garwood, Chris Craft, and Matthews as well as many other boat builders of the 1930s. In the 1930s for their larger engines they used Hercules industrial engines as a base for conversion as they did with the Lincoln Zephyr V-12 engine as well. It appears the company ceased operation in 1958. 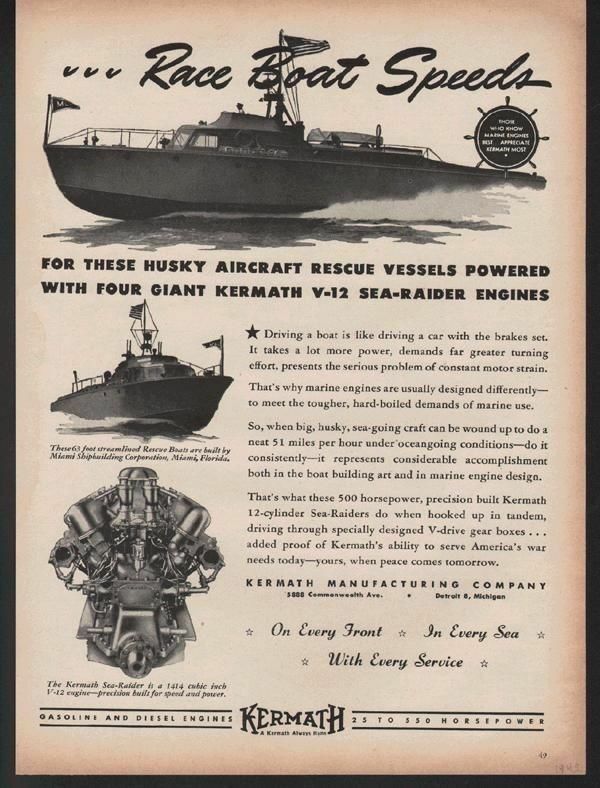 In reading the ad below, keep in mind that the four engines in the ad were only used in a very few, and very early, 63 ft. rescue boats at the start of World War II. Typically three of these engines went into the 104 ft. rescue boat which was much slower.